There's nothing worse than your hair falling flat shortly after you've styled it, so keep it in place with Moroccanoil Luminous Hair Spray. It gives a long-lasting and flexible hold, without weighing the hair down or leaving a sticky, crunchy residue. 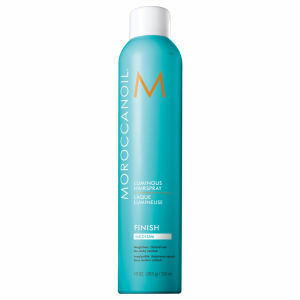 Giving hair a reflective shine, the antioxidant-rich formula is infused with argan oil, which conditions hair and helps to maintains soft, natural styles. Eaily brushed out, the spray eliminates frizz and is ideal for fighting humidity in warm weather. For added volume, spray directly onto roots only and style as usual. Argan Oil: Moroccanoil's signature ingredient. Only found growing in Southwest Morocco, this powerful antioxidant and UV protector is rich in vitamins that help to strengthen the hair and increase its elasticity.